Keeping the passion alive in a relationship can take work, but there are ways to make it easier. We have done a little searching to help in the transition from dull to exciting. 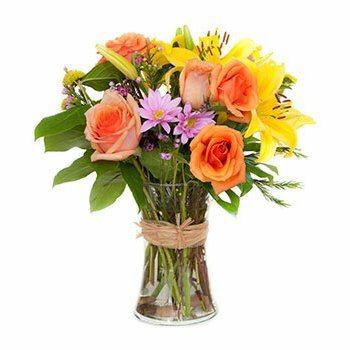 Your recipient will receive a vibrant bouquet with peach Roses, stunning yellow Asian Lilies, and pink Chrysanthemums, ready to display in a Glass Vase. Spice up your routine with a surprise, spoil her on her birthday, or simply show her how much she means with A Touch Of Fire.